For many people, the importance of the roof is strictly related to its appeal. Let's face it, we all want our houses to look fantastic but it is just as important for the roof to have a clear purpose and that is to protect the rest of the building. One does not understand how essential a good roof is to a house until leakage occurs. It goes without saying that, by using top quality roofing materials, you also guarantee a higher longevity for your roof. 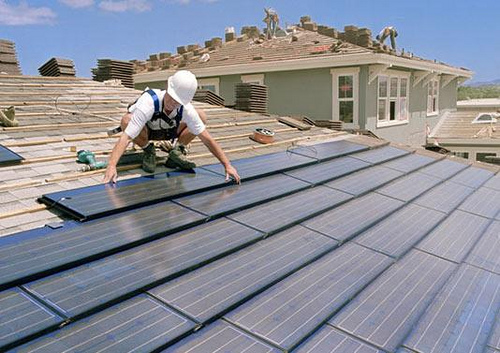 Just as with any other material used on a roof, the same goes for composite shingles. The higher the quality, the longer they will resist on a house. There are premium composite shingles available on the market and this will have definitely the longevity you want. You have to stay away from cheap composite shingles, regardless of how tempting a reduced price might be. The best roofing material of this type is made of fiberglass mat and coated with asphalt. This makes it waterproof and highly resistant; plus, premium materials also have an additional layer of crushed rock. This is need the best roofing material in terms of strength and beauty. Wood shake shingles can be a versatile yet practical choice, especially as they are highly resistant in all weather conditions. Also, it might interest you to know that wood shake shingles resist any type of insect damage and they are not at all affected by the sun. This is the reason why this roofing material has been increasingly used on personal properties and also on commercial structures. Its excellent insulation is one of the key features that makes it an attractive option. We are living in an age where this is the best roofing material. However, it is highly important to find someone who is an expert in metal roofing. This may be the best material to protect a building but only if it is correctly installed. One of the reasons why sheet metal is preferred is because it is highly durable especially on low temperatures and it can be easily recycled. The only slight disadvantage would be the risk for rusting. However, with regular maintenance and different types of coatings (anti-rust, waterproof, heat reflection or ceramic), you can be 100% certain that you will not have a rusty roof. If you want the best roofing material to keep out rain, then Spanish tiles should be your number one choice. Thanks to the waterproof glaze, you can be sure that your roof will never have leakage. The interesting thing about Spanish tiles is that they are placed in parallel rows, each row overlapping the one below. In this way, rainwater is 100% excluded and your roof is a protective weather solution for many years to come. Just think about the 100 year guarantee that comes with these Spanish tiles. Slate is the most durable and certainly best roofing material. It is made from real stone and it is the best choice for a roof, thanks to its low water absorption index. This makes it waterproof and another advantage would be the high resistance to frost or freezing.